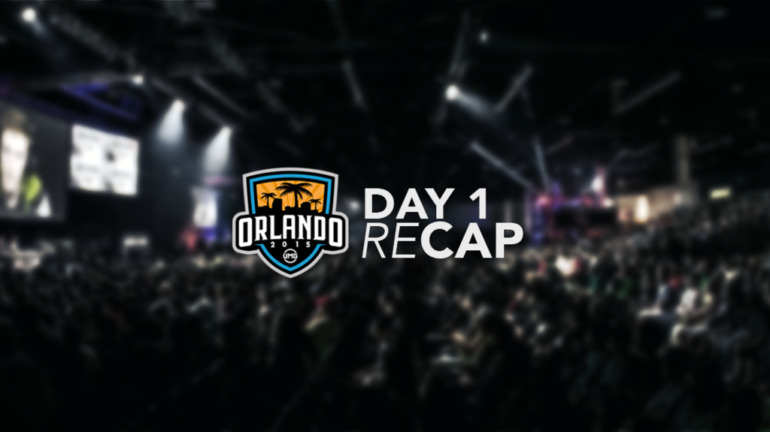 A recap of pool play matches during Day 1 of the tournament. Day 1 consisted of upsets and disbelief as many of the popular named teams such as OpTic Gaming, FaZe, and Team EnVyUs fell surprisingly hard to other teams. *Note that this recap only covers mainstage matchups due to the inconsistency of the UMG stream throughout the day. Solar – Hardpoint: OpTic started the game out hot, by taking quick control over tR in the first couple of minutes. tR regained control and managed to tie the game at 133-133. The game continued to go back and forth, leading up to the final hill, which tR gains control quickly of, resulting in a 216-184 win against OpTic. tR went up 1-0 in the series. Recovery – Search and Destroy: OpTic started the game off by winning round one with a quick two piece from Seth “Scumpii” Abner and a finishing kill by Matthew “NaDeSHoT” Haag. The rounds continued very closely ending up with a 6-5 dramatic win for tR, as they went up 2-0 in the series. Ascend – Capture the Flag: The round started out in a close stalemate similar to the prior games. tR came out victorious taking out the opposing team twice to go up 2-0 by the end of the first half. OpTic was able to trade two captures, but tR answered with two of their own. tR took the game 4-2 and the series with a swift 3-0 sweep. Bio Lab – Hardpoint: EnVy started the game out strong, gaining a 25 point lead by the second hill. Anthony “Nameless” Wheeler grabbed a huge three piece on the third hill to extend the lead vs. Denial. Denial started to shorten the lead and made clutch plays to win 219-211 against EnVy going up 1-0 in the series. Terrace – Search and Destroy: EnVy came out hot with a round one win, but Denial quickly returned the favor, tying up the map 1-1. James “Clayster” Eubanks got a hitmarker on an amazing snipe that could have altered the game, but ended up getting taken out. Denial won 6-2 in a dominant fashion after that, going up 2-0 in the series. Detroit – Uplink: Points traded consecutively as the first half ended tied 5-5. Denial made the first attempt to break the tie, but failed. Nameless made a huge play to win the game 6-5, and take one round in the series, being down 1-2. Retreat – Capture the Flag: Kills were traded back and forth with EnVy gaining a 1-0 point lead by the end of the first half. Chris “Replays” Crowder made a huge three piece to allow his team to capture and tie the game 1-1. Denial closed out the game killing all of EnVyUs’ members and winning the map and series 3-1. Detroit – Hardpoint: OpTic Gaming’s momentum was diminished after getting 3-0’d by Team Revenge in their first Pool Play matchup, giving Stunner the advantage. Stunner was able to take map one 250-113 in a dominant fashion, going up 1-0 in the series. Solar – Search and Destroy: OpTic was able to put in a few rounds against Stunner, but were quickly shut down. Multiple rounds were kept close, in clutching situations, but OpTic couldn’t push hard enough. Stunner was able to capitalize and win 6-3, and went up 2-0 in the series. Bio Lab – Capture the Flag: Both teams played exceptionally well throughout both sides of the match. OpTic was able to tie up the second half 3-3, forcing the first CTF overtime in UMG Orlando. Stunner was able to win in OT taking the series with a 3-0 sweep against OpTic Gaming. Detroit – Hardpoint: Both teams struggled throughout the map to gain a substantial lead on one another. Kills and points were traded between JusTus and Prophecy. Prophecy was able to come out on top with a close 225-222 map victory, going up 1-0 in series. Solar – Search and Destroy: Prophecy went up 3-1 uncontested against JusTus, until Steve “Mochilia” Canle was able to get a huge kill being down 2-3. Unfortunately for JusTus, Prophecy went on to win three consecutive rounds to win 6-2, and went up in the series 2-0. Bio Lab – Capture the Flag: Kills and captures were traded multiple times, but nothing became of it as the first half ends 0-0. JusTus started strong killing three of Prophecy’s players, allowing Nicholas “Classic” Costanzo to capture the flag. JusTus responded by putting in two captures and won the map 3-0, being down 1-2 in the series. Comeback – Uplink: Richard “Ricky” Stacy was able to get a quick point on the board for his team off the start. Classic was able to reply with a dunk after a miss throw from Josiah “Slacked” Berry. Caps went back and forth in the first half with JusTus up 5-4. Teams continued to make huge plays, but Prophecy carried their momentum to the end to finish the map out 12-7 and the series 3-1. Retreat – Hardpoint: Both teams played at each other’s throats winning and losing hills. The game was overall played quite close, but OpTic Nation was able to uphold their close 207-196 win against Prophecy, going up 1-0 in the series. Detroit – Search and Destroy: Rounds continued to stay close as both teams played pretty evenly throughout the match just as they did in the prior map. It came out in Prophecy’s favor winning a forced round 11, 6-5 to go up 2-0 in the series. Comeback – Uplink: OpTic Nation goes up 7-1 by the end of the first half. Tyler “TeePee” Polchow got his team three more points on the board to lead the map 10-2. TeePee has captured all 10 points for his team to close out the game 10-4, being up 2-1 in the series. Bio Lab – Capture the Flag: Prophecy started off fast, up 2-0 in captures, with Chris “Parasite” Duarte dropping five important kills without dying. TeePee was able to get two huge captures for ON as they played offensively to go 2-2 in captures by the end of the first half. TeePee got a huge two piece to break the tie, but Prophecy was able to tie the game forcing overtime. Ricky was able to get a huge cap to take the game 6-5 in OT, forcing a game five. Riot – Search and Destroy: Prophecy quickly obtained a 3-1 lead, but OpTic was able to tie up the series later on 4-4. Prophecy was able to win the next two rounds, taking the map 6-4, and the series very close 3-2. Here is an overall view of the Pool Play results from Day One. This concludes eSportsNation’s UMG Orlando: Day 1 Recap. Let us know how you feel about today’s surprises and disappointments.